This book covers in detail one of the most important aspects of Flex 2: bringing data into applications from various sources and manipulating and presenting that data. It covers all the major possible data sources. In Foundation Flex for Developers, Sas Jacobs explores in detail how to create professional data-centric Flex 2 and Flex 3 applications. 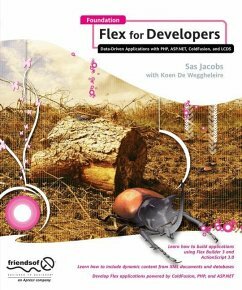 In the first half of the book, she starts off with a brief exploration of Flex and ActionScript 3.0, before looking at application essentials in detail, including creating custom components, user and web browser interactions, binding, formatting and validating data, debugging, and more. The second half of the book focuses on connecting Flex to data sources and covers XML, Flex Data Services, PHP, ASP.NET, and ColdFusion in detail, via a series of step-by-step case studies. Sas Jacobs is a Web developer who loves working with Flash. She set up her business Anything Is Possible in 1994, working in the areas of web development, information technology training and technical writing. The business works with large and small clients building web applications with ASP.NET, Flash, XML and databases. Sas has also spoken at conferences such as Flash Forward, MXDU and FlashKit on topics relating to XML and dynamic content in Flash. In her spare time, Sas is passionate about travelling, photography and enjoying life. One of her most fervent wishes is that Flash will take over the Web!